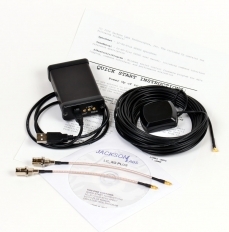 The LC-XO-PLUS GPSDO 10MHz reference Kit is a complete solution for providing extremely accurate 10MHz, 1PPS, and Position-Velocity-Time information anywhere in the world. It includes a high-performance GPS receiver that can acquire and track up to 50 GPS signals down to a state of the art –160dBm, a low-noise 5V CMOS 10MHz and 3.3V CMOS 1PPS output, USB control interface, precision voltage references, and DACs. It generates a low-noise 10MHz signal with typically better than 1E-010 precision and accuracy (0.1ppb), better than 250fs jitter (20Hz to 2MHz) and a 1PPS signal with typically better than +/-25ns stability when locked to GPS. 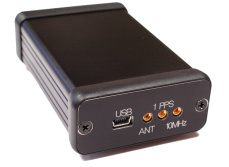 The unit is built as an easy-to-use small enclosed box that operates and receives power by plugging into a PC USB port, and into the supplied GPS antenna. The unit also provides a TTL level status output, and it may be operated from an optional 5V power supply. The board is supplied with a USB cable and matching wall-wart power supply, two MMCX to BNC adaptor cables, a GPS antenna with 10m length, Z38xx control, plotting, and command Windows application, and a quick-start guide.